in the bottom of the wells for proper concentrations and improved yields. In spite of its remarkably small footprint (9x10 in. 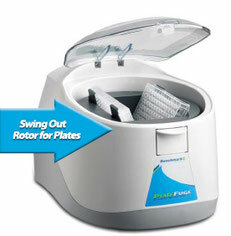 ), the PlateFuge™ includes a uniquely designed, swing out rotor (patent pending) capable of securing 2 microplates. The easily accessible rotor chamber includes two plate carriers that rest at a 75° angle. This allows plates to be inserted confidently without sealing tapes or caps. With a g-force of over 400 xg, most samples can be spun down in less than 20 seconds. To end a run, simply open the lid and the automatic, electric brake brings the rotor to a quick, smooth stop in about 7 seconds. Plates can then be easily removed from the rotor. Get newsletter from GeneON with special offers! 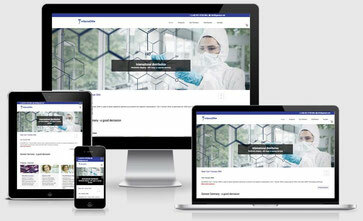 New Website for our customers!